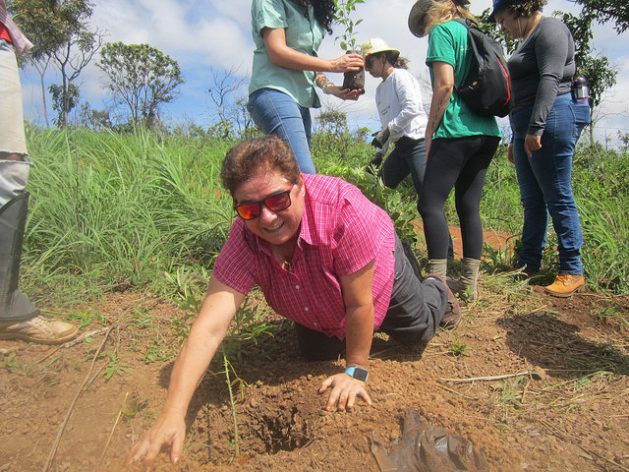 BRASILIA, Dec 8 2018 (IPS) - For the first time in her life, retired physical education teacher Elizabeth Ribeiro planted a tree, thorny papaya, native to Brazil’s central savanna. The opportunity arose on Nov. 28, when the Pipiripau Water Producer Project, which is being carried out 50 km from Brasilia, promoted the planting of 430 seedlings donated by participants in the eighth World Water Forum, held in the Brazilian capital in March. “I learned about the project during the Forum and I fell in love,” explained Ribeiro, who donated the equivalent of 13 dollars for the purchase of seedlings and the invitation to plant. Vanira Tavares, a veteran English translator and also a brand-new tree planter, did the same thing. Reforestation, especially along riverbanks, is just one of the many actions that make up the Water Producer Programme (PPA) designed in 2001 by the National Water Agency (ANA), the national regulator of water resources. Soil conservation measures, which retain water, preventing erosion and sedimentation of rivers, also contribute to the quantity and quality of water available at each site. It is easier to drive along the roads of the Pipiripau basin than in other rural areas. Instead of potholes and puddles there are gutters that capture the runoff rainwater, which is stored in subsurface galleries, referred to as “barraginhas” (small dams) along the roadsides. As a result, heavy rains no longer flood the land, washing away nutrients and covering the soil with waste products. And the retained water feeds springs and crops longer. 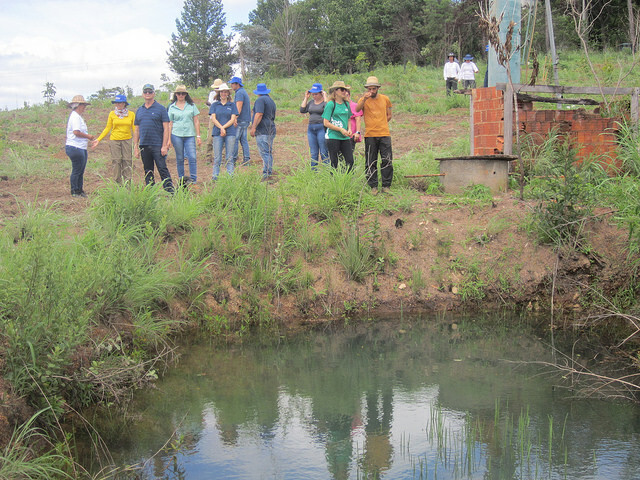 Water must also be harvested: this is the concept disseminated and put into practice by the PPA, which has implemented 60 projects across Brazil, with the aim of restoring sub-basins that supply large springs or rivers on which millions of people depend. Farmers who join the PPA projects receive payment for environmental services, estimated according to different criteria, such as the possible water contribution or the value of the crop that is not planted because the land is allocated for reforestation. These payments are key to encouraging farmers to participate, but the amounts vary widely in contracts between the payer – usually the municipality – and the owners of the land. “Where there is a shortage of a given product, the price goes up,” Ewandro Moreira, ANA’s assistant coordinator for these projects, told IPS. The Pipiripau, where one of the first PPA projects was carried out, crosses the northeast of the Federal District and supplies a large part of the population of Planaltina and Sobradinho, satellite cities of Brasilia that total about 260,000 inhabitants, according to the district planning agency. This project was born in 2011 because of “the dispute over the river’s water between public supply and irrigation, accentuated during times of scarcity between August and October,” said Rafael Mello, superintendent of water resources for the Federal District’s Water, Energy and Basic Sanitation Regulatory Agency (Adasa). Adasa coordinates the management of the project in which 17 different entities are involved, ranging from government water, agriculture and environmental agencies to non-governmental organisations, in addition to the state-owned Banco do Brasil bank and the government agency in charge of roads. All these “partners” come together in the Project Management Unit, in order to coordinate the multisectoral collective decision-making process, which boosts efficiency. “Sometimes reforesting riverbanks does not solve the problem,” if, for example, agrochemicals and sediment continue to run off into the rivers, water resource specialist Rossini Matos Sena, who represents ANA in the management of Pipiripau, told IPS. “Production and water resources have to be harmonised,” Moreira said. This requires techniques such as direct seeding in undisturbed soil, where the straw is left to cover the soil, contour farming, which involves tilling sloped land along lines of consistent elevation to conserve rainwater and reduce soil losses, or terracing (deeper furrows that retain water between the rows of crops). Pipiripau benefits from the knowledge of Geraldo Magela Gontijo, who has 32 years of experience as an agricultural technician and local manager of the Technical Assistance and Rural Extension Agency of the Federal District. “Before, 100 percent of the irrigation here was done through furrows in the ground. The water we have today would not even cover 10 percent of the needs, because that method of irrigation wastes a lot of water and now it rains less: the rate dropped from 1,600 millimeters a year to 1,100,” Gontijo told IPS. Drip irrigation, used “in 99 percent of vegetable production,” now widespread, allowed adaptation, according to the technician, who also became a farmer and produces tomatoes, grapes, passion fruit, peppers and even pitajaya, a little-known fruit from a cactus, common in the Andean countries and Central America. 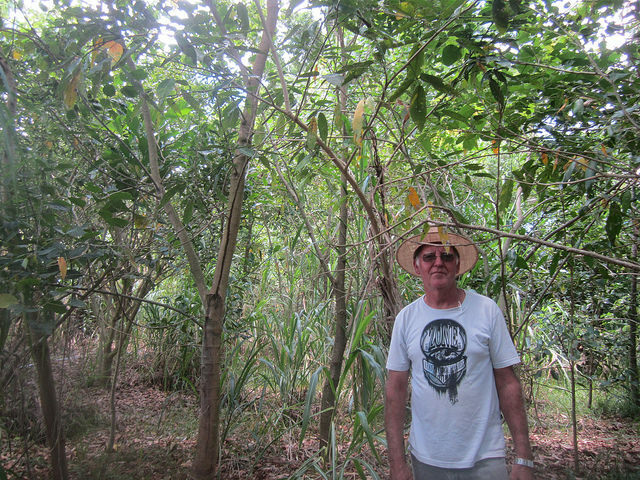 He also reforested the banks of the stream that runs across his 2.3 hectares of land. In three years a dense forest emerged with trees about five meters high, which encouraged his neighbours to do the same. A major advocate of the Pipiripau Water Producer Project is Fátima Cabral, who was born in southern Brazil 59 years ago and was a city-dweller until she gave in to her husband’s pressure to buy a 40-hectare farm at the beginning of this century. When she learned about the PPA in 2012, she began to abandon conventional farming techniques. “I was really impacted, and I joined in,” she said. Her children also pushed for the farm, named Pé na Terra (Foot in the Earth), to make the transition to agroecology. Cabral, active and a good speaker, joined together with her neighbors and farmers of the Oziel Alves III settlement, created by the government’s agrarian reform programme, to found the Association of Agroecological Producers of Alto São Bartolomeu (Aprospera) in 2016, and was elected president of the association. “I overcame my prejudice against the people in the settlements” created by the agricultural reform, she confessed to IPS. The settlement is made up of 168 poor families, who have 7.5 hectares of land. Aprospera’s breakthrough was to create 13 Community Supported Agriculture (CSA) groups, a new model of partnership between consumer and farmer groups, to secure a fixed income in exchange for healthy food in an ongoing arrangement. There are a total of 25 CSAs in the Federal District. “It’s like a marriage, which generates affection and gives urban consumers a reconnection with the land,” summed up Cabral. Aprospera helps drive the Pipiripau Water Producer Project, which has 177 affiliated properties, a third of the total in the basin. “There we planted more than 300,000 trees, reforested nearly 200 hectares, and made 1,200 ‘barraginhas’,” Rossini Sena said. 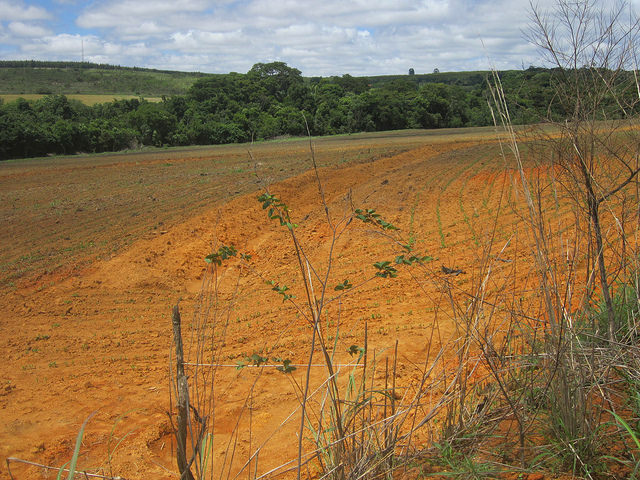 The 60 PPA projects throughout Brazil pay environmental services to some 1,500 farmers, estimates Moreira, who laments the difficulty of producing reliable statistics given the flexibility and evolution of the projects. The Federal District, with three million inhabitants, is mainly supplied with water from the Descoberto system, a river with a reservoir. Some actions began in that watershed, but “we haven’t yet implemented payment for environmental services,” said Adasa’s Mello. “Pipiripau’s model doesn’t work here, because each basin has different characteristics. The reservoir is protected by wider riparian forests,” he concluded.